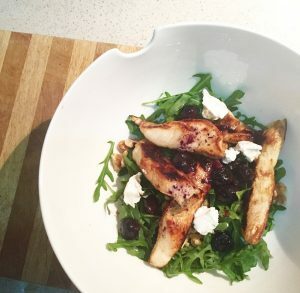 The blueberries add a delicious sweetness to this meal, whilst the mirin makes the chicken beautifully tender. Drizzle sliced chicken with mirin, then add to pan. Place rocket leaves into a salad bowl and top with chopped walnuts and crumbled feta. Meanwhile, heat a little macadamia oil in a small fry pan over medium heat. Add blueberries and gently sauté for 3-4 minutes, or until mixture starts to gently bubble. Add chicken to the salad bowl, then top with blueberry mixture. Serve with cracked pepper to taste.